Walk-In Tub Oswego, IL - RJ Kuhn, Inc. If you or someone you care about is suffering from arthritis or other painful conditions, you should consider installing a Walk-In Tub. Oswego, IL residents know that RJ Kuhn has the expertise to help you understand all the options available to you for a Walk-In tub. Oswego, IL residents appreciate that RJ Kuhn offers high-quality 9 gel-coat fiberglass Walk-In Tub models. Every model we install comes with a number of safety features, including a walk in (or step in) entry door, a safety grab bar, a built-in seat and a non-slip floor. All of the Walk-In Tubs we provide come with a polished chrome faucet with hand-held shower that is easy to use and easy to reach. At RJ Kuhn, we offer Walk-In Tubs that are the highest quality at reasonable prices. Our Walk-In Tubs also come with different hydrotherapy options, including The Custom Hydro Massage System (also known as a Whirlpool System), The Air Massage System and The Dual Massage System. 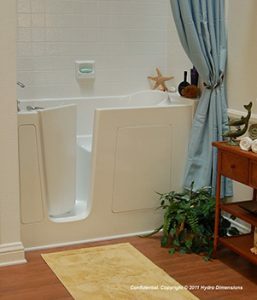 At RJ Kuhn, we help our customers tailor their Walk-In Tub to suit their specific needs. Would you like to know more about the benefits of having a Walk-In Tub? Oswego, IL residents should contact RJ Kuhn at (630) 554-3336 to find out more about how we can help you or someone you love with a Walk-In Tub.